First Energy needed to remove asbestos and other hazardous materials prior to demolition from it's closed plant located in Toronto, Ohio. 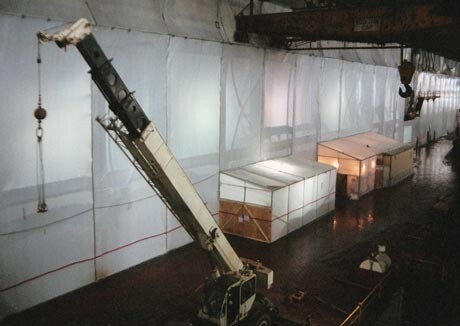 The Toronto plant required the removal of 244,000 square feet and 60,000 linear feet of asbestos-containing insulation. The plant also had PCB-containing transformers and ballasts, mercury-containing bulbs and switch controls along with hazardous and non-hazardous oils and chemicals that needed to be removed and either recycled or disposed. The greatest challenge of the job involved working through potential floods at the Toronto facility, located next to the Ohio River. Since the project was scheduled during the river's peak season, water could flood the building through abandoned mechanical effluent systems. To manage the threat of flooding, Precision responded by having our IT department install wireless transmitters and cameras showing a view of the Ohio River and the outfall from the pumps used to de-water the basement. We also installed sensors that would monitor when the river hit a dangerous height, and trigger a camera to automatically send photos by e-mail to our project supervision. Additionally, we created a website where supervisors could view images of the river, updated every minute, from their Blackberry devices. This protocol allowed Precision to work only when safe, and to evacuate crew members out of the site if river conditions changed rapidly. Our crew with strong support of local labor union members peaked at 65 workers. We were able to control the water, clean the building of all sludge, and complete the abatement of the 11 boilers within the eight month schedule. Asbestos abatement and environmental remediation on a closed power plant.